Blush Pink is one of this summer’s hottest color schemes. Pair this soft hue with gold for a little sparkle or even mix it with silver, gray, or other metallic colors. Blush pink is a soft and feminine color that so many brides are loving and incorporating into their weddings for a soft, sophisticated, and clean look. You can even use different shades of this light and airy pink hue to mix ‘n match the bridesmaid dresses. Blush pink peony bouquets, shoes, wedding invitations, and cakes are just some details of a wedding that you can use to take on this trend. Keep scrolling to see how others have used this fun color in their wedding! This color is flattering on any skin tone and body type. Mix in the blush pink tones with sequins and metallic jewels for a bridal party with some extra pizazz and style or mix ‘n match different shades of this light pink color for some variety and excitement. Your bridal party will photograph beautifully in this feminine shade. Your cake is sure to be Instagram-worthy if you incorporate this aesthetically pleasing color in with your dessert table. This soft color reminds us of light and fluffy cotton candy­­––absolutely delicious! Your guests won’t be able to take their eyes off a beautiful decorated pink cake with gold accents. Guests will be anticipating the day of your gorgeous and whimsical wedding when they catch a glimpse of your beautiful blush pink invitations. Marble designs are a hot detail in the wedding industry right now. Whether it’s a marbled pink invitation with gold accents or a matte pastel pink-colored set of save-the-dates, your invites are sure to wow in this beautiful shade. This light color is eye-catching and joyful looking, the perfect first impression to give to your guests. Feeling really daring? Incorporate this trend in a more unconventional way by saying yes to a blush pink dress. It’s a far cry from traditional, but it’s flattering, memorable, and sure to wow your guests. Imagine yourself walking down the aisle in a dress covered in a barely-there pink shade with lace accents and a gorgeous, billowing train. Can’t you just hear the oooh’s and aaahh’s? A blush pink dress unexpected and reserved only for a certain type of bride––the risk taker. Take a hint from this beautifully set table. 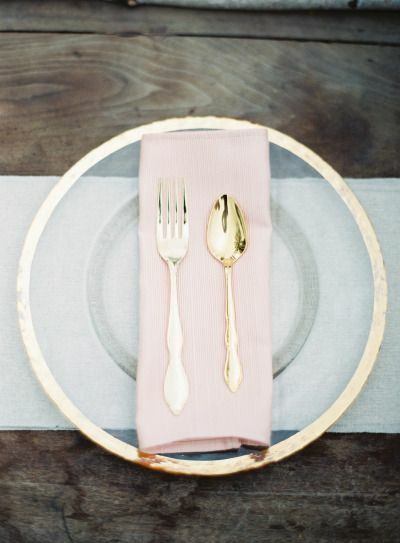 Gold flatware looks absolutely to die for up against the background of blush pink dinner napkins. We love the look of mixed metals with this pretty pink color that millennials love so much. Add a touch of pink flowers and your table will fit right in with your color scheme. You can even use pink signs to number your tables. 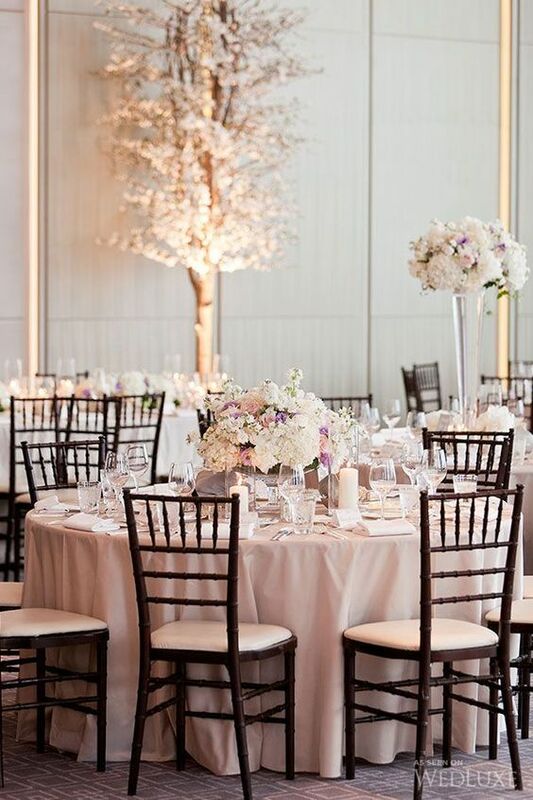 Or add a pink table cloth and your reception is sure to look like a blush colored wonderland. Pink peonies, roses, tulips, any floral arrangement will look delightful in this lovely shade of pink. The soft tone will look gorgeous and positively whimsical as the bride carries her bouquet down the aisle. Whether it’s a simple round bouquet or even a pageant style bouquet, you can’t go wrong with blush pink roses. Keep scrolling for more blush pink inspiration! We hope you've been inspired to take on this popular new trend! Tag us in your blush pink wedding on Instagram!